Enrichment classes in Art, Music, and Spanish are taught in relation to the Montessori curriculum. These enrichment classes are included in the program. The children study various artists, periods, movement, and style. Artwork is based from their study of a period and artist. Different art mediums such as clay, acrylic, oil, watercolor, chalk, and more, are used to create the children’s artwork. Individual creativity is encouraged through independent child-directed art activities. Impressionism - Claude Monet, Alfred Sisley , Pierre-Auguste Renoir., Camille Pissarro, Frederic Bazille, Edgar Degas, Gustave Caillebotte, Edouard Manet, and the American Mary Cassatt. Abstract Expressionism- Willem de Kooning, Jackson Pollock, Arshile Gorkyand more.. 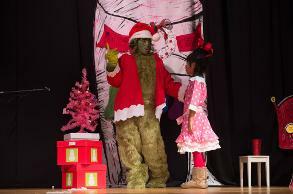 The children learn and sing various songs including children’s songs, Broadway, standards, and other contemporary songs. 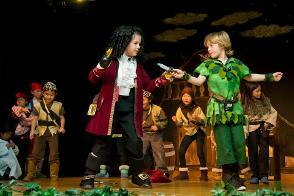 The children learn about the aspects of theater and performing on a stage. 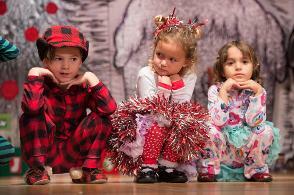 MCDC conducts a Children's Musical Theater. Romantic – Johannes Brahms, Hector Berloiz, Camille Saint-Saenz, Richard Staruss and more..
Spanish is the second most spoken language in the world with 392 million Spanish-speaking people in 22 countries. The ability to communicate in the native language of so many will give your child a tremendous advantage throughout his or her life. Learning a second language opens learning pathways in a young child's brain that remain permanently encoded. Children will benefit from this encoding all of their lives A variety of techniques, including building a base of phonemic awareness and a familiarity with basic vocabulary through songs, games and play are introduced. On site professional instructors teach activities that are offered at MCDC. Classes are conducted once a week for approximately 30 minutes. Tuition, date, and time varies per class. Martial arts is a fantastic way to build confidence in yourself and get a great workout. OTKD instructors will work with each child to develop goals and evaluate him/her every step of the way. Each child will learn the basics of self-defense, as well as discipline and a code of ethics that ensure his/her success in the classroom as well as in everyday life. Little Star Sports is designed around the child having a complete experience. Gross motor skills, two ball sports, muscle tone, physical fitness, and various activities which enhance hand eye coordination and brain development are compiled into one action packed 30 min class, making it a fun and positive learning experience. This class offers the child a variety of sports namely soccer, hockey, football, basketball, baseball, volleyball, golf and lacrosse. It starts with the basic fundamentals of each sport working toward well-developed skills and games. Each sport is carefully broken down so the child understands all the basic elements. Laura Roberts School of Dance (LRSD), established in 1986 in Huntington Beach California, has been providing the highest level of quality dance training to the Huntington Beach area for over two decades. Ms. Roberts feels the training of young dancers requires special attention and that it is best to commence dance training at an early age while the body is still supple and can be channeled into the proper positioning and muscle development. Children will learn to read music quickly using different methods of teaching to interplay musical terms with your child. Basic music fundamentals, notes, rhythm, keyboard training, and singing are taught. Children will learn to play and perform a variety of songs for their family and friends. Basic keyboard training, semi private, private piano, and private voice lessons are offered. A recital is held at school. TennisKids LLC is a leader in youth tennis development and instruction for children ages 2 to 8 yrs. Much like the Montessori philosophy, we provide a teaching environment that encourages and respects a child’s natural and psychological development. We teach tennis fundamentals through games and child-friendly activities. Our carefully developed curriculum creates a love and passion for the game of tennis, while fostering invaluable life-long skills.